The flavors of dark chocolate and tahini, a sesame paste with origins in the Middle East, work surprisingly well together. 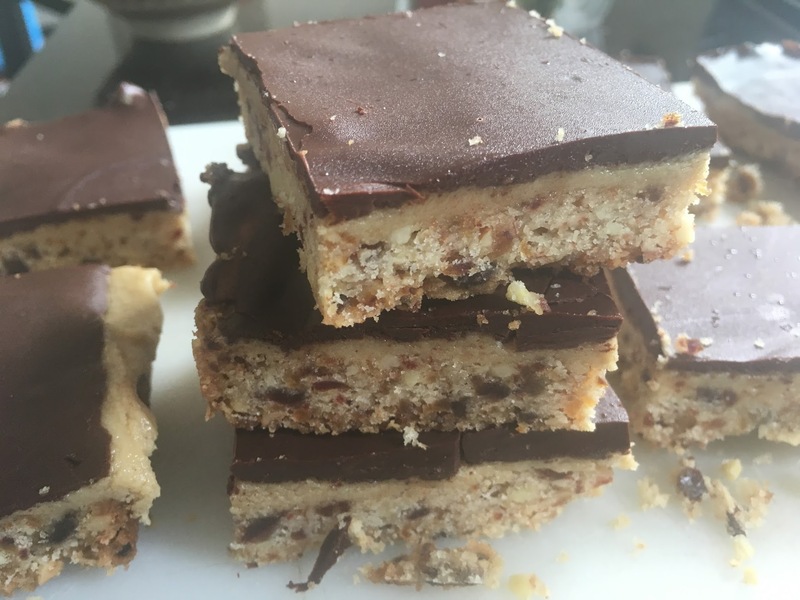 I originally set out to make chocolate tahini truffles, but ended up creating this bar cookie instead. 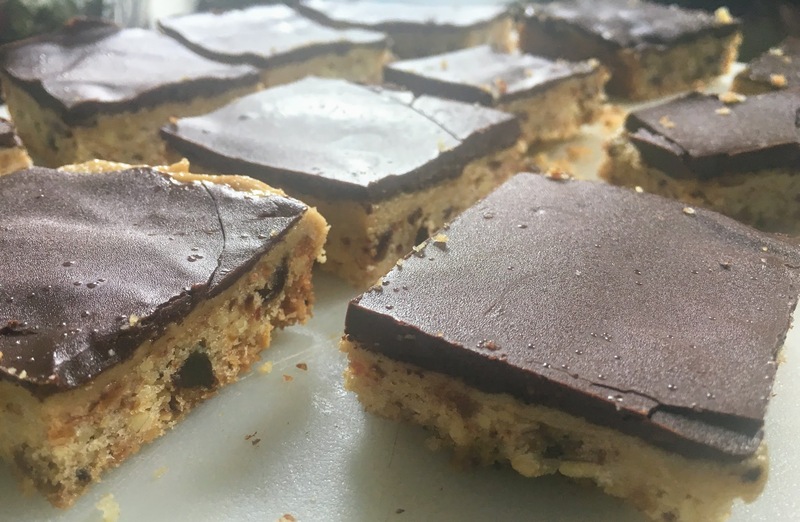 Served cold, with an almond-date crust, creamy tahini filling, and dark chocolate glaze sprinkled with sea salt, it’s reminiscent of the Nanaimo bar, a popular no-bake Canadian dessert (named after a city in British Columbia) with a custard filling, graham cracker crust, and top layer of melted chocolate. Prepare the crust: Preheat oven to 375 °F. Grease or line a medium-sized baking pan (I used a square 10 x 10 inch pan, but smaller would work well too) with parchment paper. Place almonds, dates, and sugar in the bowl of a food processor, and pulse until finely ground. Add flour and butter. Process until just combined. Spread mixture onto the bottom of the baking pan. Bake for around 20 minutes, until golden brown. Set aside to cool. Prepare the filling: In a small bowl, mix together tahini, honey, and almond extract until smooth. Spread evenly over the crust. Cover pan with tinfoil, and place in the refrigerator. Prepare the glaze: In a small saucepan or microwavable bowl, heat chocolate and butter over the stove or microwave for around 1 minute, until just melted. Stir until smooth. Remove pan from fridge, and spread chocolate glaze over tahini filling. Sprinkle evenly with sea salt. Refrigerate for at least several hours, or overnight. Cut into squares and serve. Store in airtight container in refrigerator.